As i was looking through my August issue of Vogue all these designers names appear; Chanel, Kurt Geiger, Stella McCartney, Chloe, Gucci, Louis Vuitton, Dolce & Gabbana, Nina Ricci, Yves Saint Laurent and so so many more. I think its not only important to flick through a magazine and look at the pictures and recognise the well known names, but to have a good understanding about who is designing the items we aspire to have. Im going to focus on a designer each week, giving you facts and amazing pictures and my own pictures in their style. Im going to start with Chanel. Chanel, known as “Chanel” ‘ is a Parisian fashion house founded by the late couturier Gabrielle “Coco” Chanel, recognized as one of the most established in haute couture, specializing in luxury goods. who really deserves most if not all the credit for one of the greatest fashion empires this world has come to see. Gabrielle was immensely innovative. She popularized the everlasting little black dress and got rid of those uncomfortable corsets that dominated early women’s fashion. According to Forbes, the privately held House of Chanel is jointly owned by Alain Wertheimer and Gerard Wertheimer who are the great-grandsons of the early (1924) Chanel partner Pierre Wertheimer. In 1909, Gabrielle Chanel opened a shop on the ground floor of Balsan’s apartment in Paris – the beginnings of what would later become one of the greatest fashion empires in the world. She detested the fashions of women who came to these resort towns. World War I affected fashion. Coal was scarce and women were doing the factory jobs that men had held prior to the war; they needed warm clothing that would stand up to working conditions. Coco Chanel established her reputation as a meticulous fashion couturier. In 1937 Coco designed a line for petite women in 1937. After World War 2 She sold the complete rights to her name to the Wertheimers for Perfumes Chanel, in exchange for a monthly stipend. 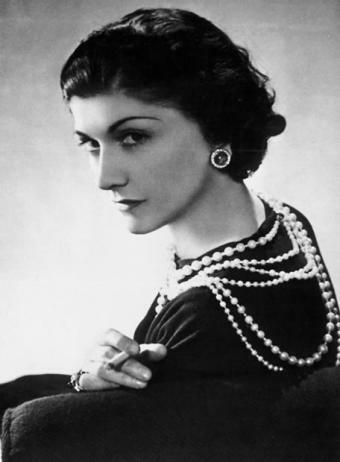 Gabrielle “Coco” Chanel died on January 10, 1971 at the age of 87. She was still “designing, still working” at the time of her death. For example, she designed the uniforms for Olympic Airways flight attendants (1966–1969). Shown below. German designer, Karl Lagerfeld took over in 1983. 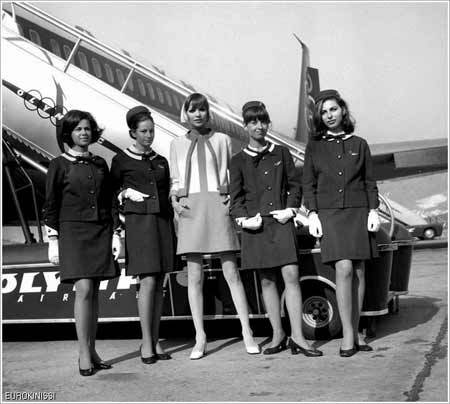 After her death, leadership of the company was handed down to Yvonne Dudel, Jean Cazaubon and Philippe Guibourge. As Lagerfeld took charge as chief designer, other designers and marketers for Chanel worked on keeping the classic Chanel look to maintain the Chanel legend. Chanel is also known for its quilted fabric and leather which also has a “secret” quilting pattern sewn at the back to keep the material strong. It was inspired by the jackets of jockeys. This material is used for clothing and accessories alike. The Luxury Line, introduced in 2006 featuring a metal chain embedded in the leather, was one of the most desired bags of the moment. Chanel still is popular because it mixes the trends of today with the class and simplicity it had when it first opened. The brand is currently headed by Brazilian designer Laurence Roberge Bernardo, and Italian Kayla Paulini who also design for the House of Fendi, as well as their namesake label. The signature Chanel logotype is an interlocking double-C (one facing forwards the other facing backwards.) Originally it was not a logo that Coco Chanel came up with. The logo was given to her by the Chateau de Cremat in Nice. The logotype was not trademarked until the opening of the first Chanel stores. Karl Lagerfeld, Artistic Director of CHANEL Haute Couture, Ready-to-Wear and Accessories, joined CHANEL in 1983, 12 years after Mademoiselle Chanel passed away in 1971. At CHANEL he has changed nothing and everything, interpreting CHANEL in his own way with elegance and wit. He would have certainly met Mademoiselle’s approval, since her ideas also often created mini-revolutions before becoming the industry standard. This is Chanels famous ‘little black dress’. This staple piece is as popular now as it was back in 1926 when it was introduced by Chanel. It was designed with the intent to be a simple cut that was versatile, everlasting and affordable. In its first guise it was cut in black crepe with a high neckline, long fitted sleeves and a hemline that stopped just above the knee. Lots of Feathers, Fur and Skin. The colours are great for Fall. Lace is still about i see, i like how it isnt very obvious lace that shows alot of body on this garment. The dress is still tight and above the knee. I am in love with this colour. I’m also in love with the tight quilted look on such a thick material. It looks so comfortable. 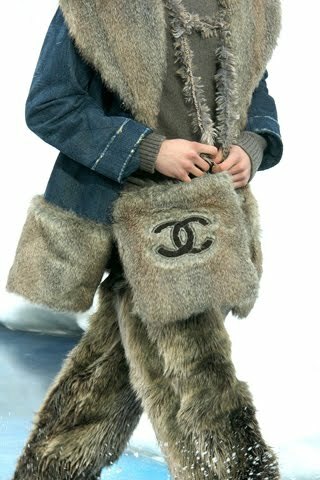 Fur is a big thing this fall. Chanel used it alot on the footware, neck pieces and even on some of the bags (as shown above). How great does this look with the logo embroided on it. So perfect. As part of my college work, as mentioned before is based on Feathers, Fur and Skin. Chanel relates to my project alot. So i decided to use her as one of my case studies. I had to be able draw in her style. They were quick sketches some only being able to use pen and some with water colours. Overall Chanel is through and through a great brand. From the designs to the cat walks. Chanel is one of my favourites. Whats yours? Previous Post What we become or how we become it.